Probably no new posts until Saturday, the 4th of August. I’m on vacation this week and most of next week. Plus, well, there’s nothing happening. I don’t see a thunderstorm pattern over the next week so it’s all about the strength of onshore flow and morning cloud cover extent. Not a professionally inspiring period so a good time to be gone anyway. It appears we go from warmer than average weather for a couple of days to another round of troughiness and cooler weather Friday through sometime next week. We won’t hit 90 in July for the 2nd consecutive year. That’s really weird. In fact it’s never happened in Portland’s history (since 1940 at least). Today was the coldest day in almost 3 weeks in Portland; a thick marine layer kept all areas west of the Cascades cool and cloudy with drizzle at times…yuck. The day was sunny and decent for me to start. It was sunny at Clear Lake (camping) this morning, sunny through Government Camp at noon. Then a plunge down into the marine layer with drizzle showing up around Brightwood. Then I shivered through a BBQ at 58 degrees this evening…there’s nothing like a warm late July evening in Western Oregon! Actually it was at the 1800′ elevation, but still, hard to believe the time of year as everyone was complaining about the cold. you see a very thick marine layer for both Sunday and Monday, then much thinner Tuesday. We’ll see how that pans out. 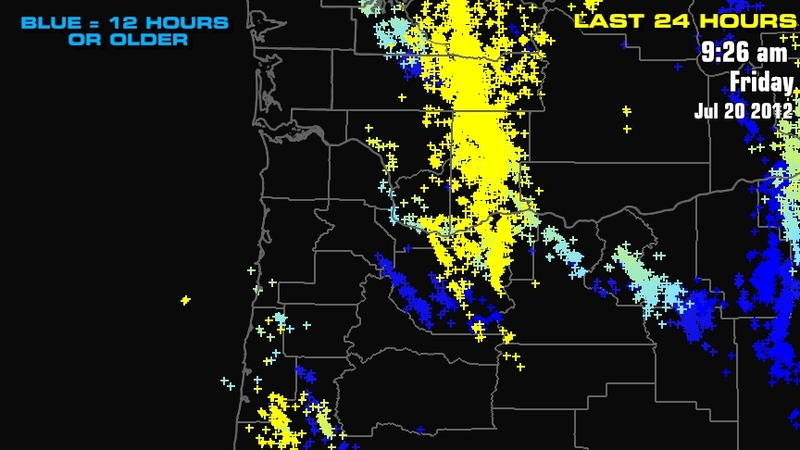 Here’s a final lightning map, showing strikes over the past 24 hours. Strikes before 9:30pm Thursday are in blue. This illustrates how tough it is to forecast thunderstorm development. Model forecasts (and ours) said there was going to be some sort of overnight event, but picking exact locations for thunder was tough. 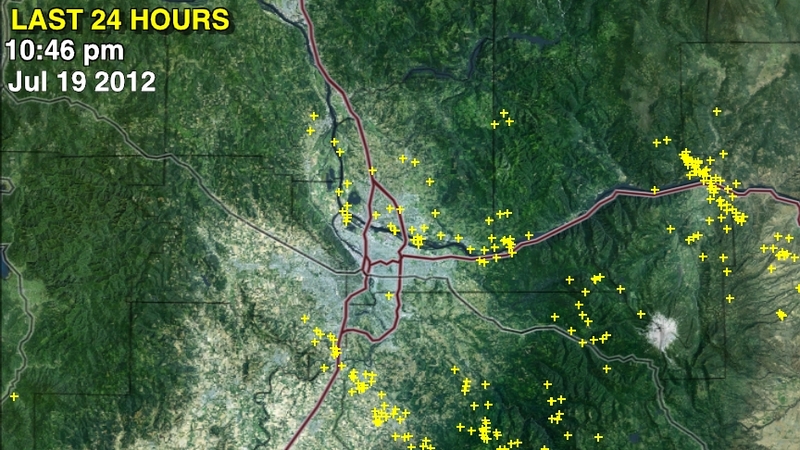 Some spots were nailed several times (eastern Clark County, Multnomah County, and Hood River County). But some of you were totally left out. Almost all of Marion & Yamhill Counties were missed. Same with extreme NW Oregon and Linn County. 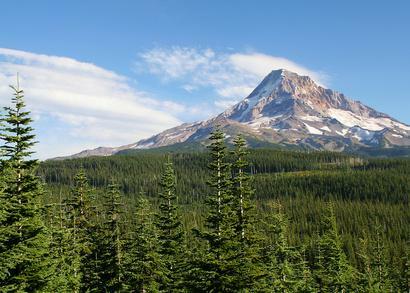 Who would have thought there would be no lightning in the Central Cascades??? I even got an email from a competitor complaining that he was stuck in Central Oregon seeing nothing while we had a nice light show here. If you missed out, you’re not alone. I saw ONE flash on the 37 mile drive home last night, then it was all quiet. Nothing the rest of the night, then AFTER daylight, lots of lightning with the band that moved up the eastside around 5-6am…I didn’t see much of anything. Observing lightning from a concrete bunker (TV station) isn’t the preferred method! On a side note, it’s always amazing how usage of the blog really heats up with exciting weather. I think yesterday had more hits than any day since the mid-March snowfall! Still active storms at 11pm over east Vancouvre, Mt. Hood, & Central Columbia River Gorge. These are lifting northwest. 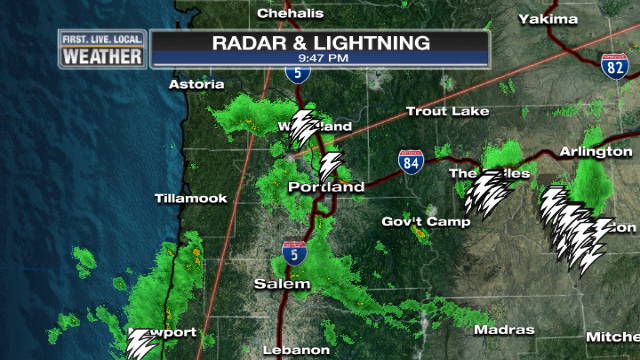 The next closest storms (right now) are down around Eugene. I expect more action through the night…enjoy! The earlier storms in south metro died after about 1/2 hour. Another nice cell developed near Vancouver Lake and has moved north of St. Helens (heading to Longview). A couple fresh strikes now in the middle of Vancouver the past 5 minutes. 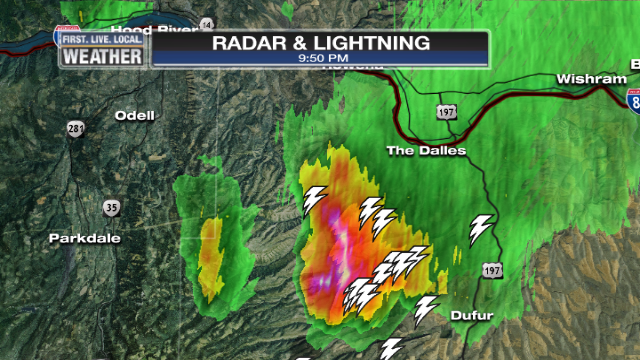 And a very intense cell in Wasco county south of The Dalles headed into Hood River County. That one may have produced quarter size hail west of Dufur. Must be a great night to stay at Five Mile Lookout! The moisture from rain in spots is sure adding to the moist feel outside too. More to come the rest fo the night. 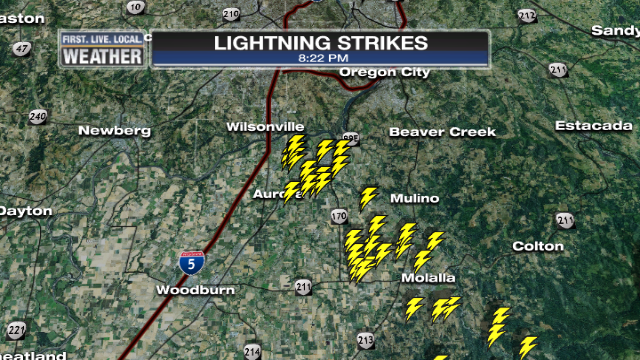 34 cloud to ground lightning strikes in a line from SE of Molalla through Aurora/Canby areas and heading into Wilsonville right now. Nice start to a humid and warm night! Enjoy the show the next half hour if you live in Tualatin, Tigard, Sherwood, and maybe even eventually Beaverton/Hillsboro. More storms picking up farther south in the Valley NW of Eugene too. Could Be A Fun Weather Night! Our best chance for a nighttime lightning show so far this summer is tonight. Everything seems to be lining up for lots of flashing, rumbling, and downpours SOMEWHERE between Eugene and Seattle; and the Portland Metro Area is right in the middle. A cool upper-level low pressure center has been sitting off the southern Oregon coastline for two days spinning moisture and occasional showers/thunder to it’s north. This afternoon we’ve already seen surface-based (from the heating of the day) storms fire over the Cascades. One briefly turned severe with large hail detected just west of Timothy Lake but it’s weakened now. 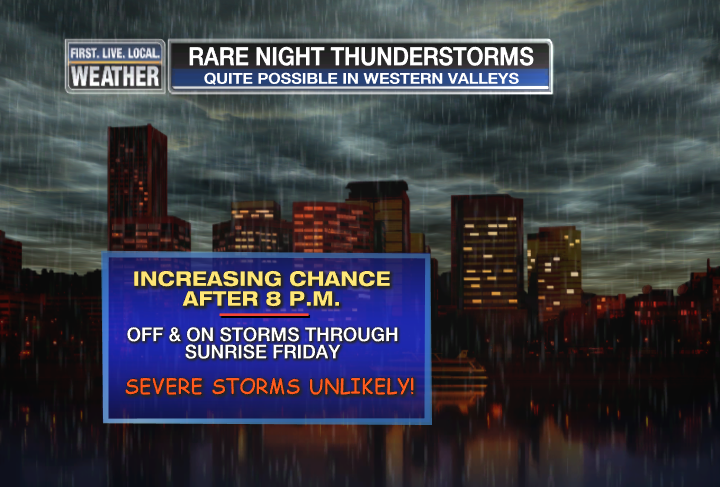 The setup is very good for a widespread thunderstorm outbreak from northwest Oregon through southwest Washington. The upper low makes it’s move to the north right over us late tonight and early Friday morning. The combination of ample moisture, lifted index down around -4 (5pm-2am), CAPE values up above 500, and good divergence aloft (for lifting) all screams “ACTION” to me. Plus a nice SSE upper level flow. So when? That’s a tough call. Our RPM model shows storms coming down off the Cascades around 8-10pm, then another surge with the actual upper level low right around sunrise. The WRF-GFS has more generalized storms firing at times overnight. Both models show better conditions with the low slightly farther west than what was forecast 24 hours ago. So now we just sit back and keep a close eye on the radar and satellite imagery…more updates later most likely. You are currently browsing the FOX 12 Weather Blog blog archives for July, 2012.